An underserved population exists of young women of color between the ages of 18 and 29 that have not been afforded access to tangible resources for basic life sustaining information and experiences. These young women are not living to their full potential having never been exposed to the information and resources necessary to live a balanced, healthy, and enriched life. Expectations are that these young women are adults who have direction in life and can make it on their own. We are needed to help them transition from young adulthood to womanhood by teaching them now what we wish we knew then. 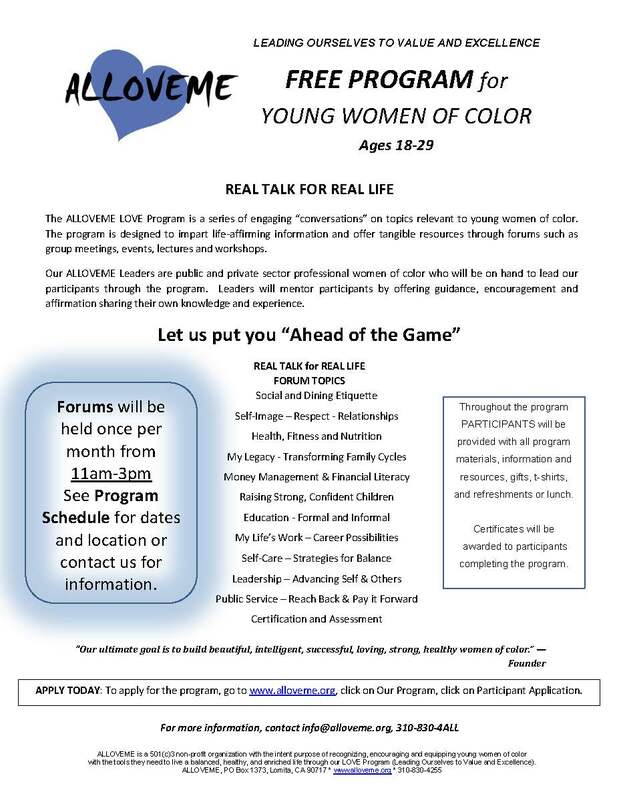 The ALLOVEME LOVE Program is a rotating series of engaging “conversations” on topics relevant to young women of color. The program is designed to impart life-affirming information and offer tangible resources through group meetings, events, lectures and workshops. Our ALLOVEME Leaders are public and private sector professional women of color who will be on hand to lead our participants through the program. Leaders will mentor participants by offering guidance, encouragement and affirmation sharing their own knowledge and experience.